I don’t think I ever paid much attention to Genesis 26 until I began to study it for this post. Like on many other occasions, I was surprised by the lessons I learned from its study. I am glad you decided to read my post, you can also listen to the audio, I believe you will be blessed by this study of Genesis 26. Maybe this comes as no surprise to you, but it surprised me. Why would there be a famine in the land that God is giving to his special people? Genesis 25:11 tells us that God blessed Isaac. As we studied in my post entitled Everything Will Be Okay everything that God promised to Abraham carried over to Isaac. So if Isaac is blessed by God, if he is living where God told him to live, and if he is being faithful to God (there is no record that he was not), why is there famine in the land? Should the famine not only happen to the people who were not God’s special people? Should not famines be experienced only by those who worship false gods? Should not our lives be better because we worship the true God? Where are the blessings? Why is there a famine? Issac, like all of the Bible heroes, and like us, lived in a sinful world. Being a follower and worshipper of the true God does not mean his life will be without difficulties, it only means that God will continue to provide for him amid the difficulties. The same is true to us today. To expect a life without struggles is to have unrealistic and unbiblical expectations, at least for a long as we live in this sinful world. With the trials come promises from God. A reminder that ultimately Isaac’s hopes and dreams, his very life was inseparably tied to God, the true God, the creator God, the God of his father Abraham. God reminds Isaac of the promises, God also gives Isaac directions, “Do not go down to Egypt” (v.2). The blessings are interestingly tied to actions. The promises are valid “because Abraham obeyed My voice and kept My charge, My commandments, My statutes, and My laws.” (v5). In case you are feeling a little lost in time, this takes place long before the ten commandments are given to Moses. At this point, there are no children of Israel. At this point its just Isaac and his family. There is no earthly tabernacle, no Levites, no ark of the covenant. Yet God mentions commandments, statutes, and laws. Could it be that God’s laws are an expression of His character and the rules of law which make heaven so heavenly? Could it be that God’s laws are universal and not meant for a specific ethnic or geopolitical group or even a specific era in time? By keeping God’s laws Abraham remained in an intimate relationship with God which caused the blessings to continue to his son Isaac. God chose Abraham and Abraham remained in a close relationship with God. Abraham was not sinless, Abraham had flaws and made mistakes, but he never abandoned God to chase after other gods. Abraham never gave up on God’s plans for his life. Now, God’s plans carried over to the life of his son Isaac. In times of famine, those promises became all the more important, vital, to the believer’s life, a coping mechanism, a hope, something to hold on to and claim in the midst of terrible trials. Maybe Abraham never told Isaac about his mistakes. Perhaps this fear was common during that time? I personally find it difficult to understand this. To be honest I find it difficult to respect a man who would lie about his wife, especially a lie that would lead to another man taking her to be his wife. I believe a man should be willing to fight for his wife, not cowardly lie and try to distance himself from her. I cannot imagine how Rebekah must have felt. It is interesting to notice the sin of the father repeated in the life of the son. Could it be that our children are doomed to repeat the sins we commit and fail to properly address? Perhaps if Abraham had talked with Isaac about his life and warned him regarding the sins he had committed Isaac could have avoided this embarrassing episode in his life. Isaac was the son of the promise, God had clearly led his wife to him, yet Isaac was a flawed human being, a liar and a coward. Isaac had lied about his wife because he was afraid he would be killed because of her. But unlike Sarai, nobody seemed interested in Rebekah, and after a long time, the king noticed something that caught his attention. I imagine Isaac sneaking around with his wife, like a couple of teenagers, trying to avoid being seen. The text is very ambiguous regarding what was happening between Isaac and Rebekah. The word used here has been used before, צָחַק (tsachaq), and is often translated as “to laugh.” (More on this word on these posts: Funny How God Works, Is Anything Too Hard for The LORD?, and especially on this post A Promise Fulfilled.) Whatever they were doing it was obvious to the king that they were clearly husband and wife. Isaac’s lie was found out, and now the pagan king was grilling him on his reckless behavior. At least Abraham’s wife Sarah was his half-sister so he had half of an excuse, Isaac had none. It is worth noting here that the King of the Philistines was aware of God’s law regarding marriage and adultery. Abimelech, a pagan king, was not only aware that adultery was wrong he protected Isaac’s marriage to Rebekah with the death penalty! Abimelech was serious and valued Isaac’s marriage more than Isaac did. Is it not amazing how God uses this pagan king to protect His chosen family? How humbling to have a pagan king demonstrate better morals than God’s chosen man, one of the patriarchs, Isaac. Then Isaac sowed in that land, and reaped in the same year a hundredfold; and the Lord blessed him. The man began to prosper, and continued prospering until he became very prosperous; for he had possessions of flocks and possessions of herds and a great number of servants. So the Philistines envied him. Now the Philistines had stopped up all the wells which his father’s servants had dug in the days of Abraham his father, and they had filled them with earth. It should not surprise us that this keeps on happening but God blesses Isaac. God blesses someone who had lied, someone who was willing to allow someone else to take his wife, the wife God chose for him. Someone who did not trust God to protect him and thought that lying would be a better option. Yet God blesses him! And it is not a small blessing, but God blessed him one hundred fold! Isaac continued to prosper and kept on prospering until he was very prosperous by all measurements, except for land or number of children. A quick note on regarding the wells. When the Philistines stopped up Abraham’s wells they were in effect trying to erase his name from history. This indicates a transition in the story. Then Isaac departed from there and pitched his tent in the Valley of Gerar, and dwelt there. And Isaac dug again the wells of water which they had dug in the days of Abraham his father, for the Philistines had stopped them up after the death of Abraham. He called them by the names which his father had called them. Also Isaac’s servants dug in the valley, and found a well of running water there. But the herdsmen of Gerar quarreled with Isaac’s herdsmen, saying, “The water is ours.” So he called the name of the well Esek, because they quarreled with him. Then they dug another well, and they quarreled over that one also. So he called its name Sitnah. Abimelech had first protected Isaac’s marriage, perhaps he feared Isaac’s God since Abraham had been famous in those lands. Now Abimelech begins to fear Isaac. Earlier Isaac had been afraid of his neighbors, and now his neighbors are beginning to fear him. God had made Isaac mighty, and his neighbors noticed it. Isaac departs and begins to revive the memory of his father Abraham by digging again the wells of water his father’s servants had dug and calling them by the same name. These wells were monuments to the power of Abraham and a testimony to the blessings he received from God. Isaac made sure that future generations would remember Abraham and his God. Not only that, but Isaac also begins to dig new wells. Isaac had surpassed his father, Isaac stood on the shoulders of Abraham and went even further. But not without struggles. Three times Isaac dug wells and two of the three there were quarrels with the locals, quarrels so bad that Isaac decided to move on. Then he went up from there to Beersheba. And the Lord appeared to him the same night and said, “I am the God of your father Abraham; do not fear, for I am with you. I will bless you and multiply your descendants for My servant Abraham’s sake.” So he built an altar there and called on the name of the Lord, and he pitched his tent there; and there Isaac’s servants dug a well. Finally the third time he dug a well there was no quarrel and Isaac recognized God’s blessings. We might get the idea that digging a well was something easily accomplished because of the way the narrative time flows, but it took skill, time and money. There is a reason there were not many wells in the area, and why people would fight over them. Imagine the stress Isaac experienced trying to sleep knowing there were angry men around willing to attack him in order to claim the well he had dug. Isaac finally dug a well and had peace. 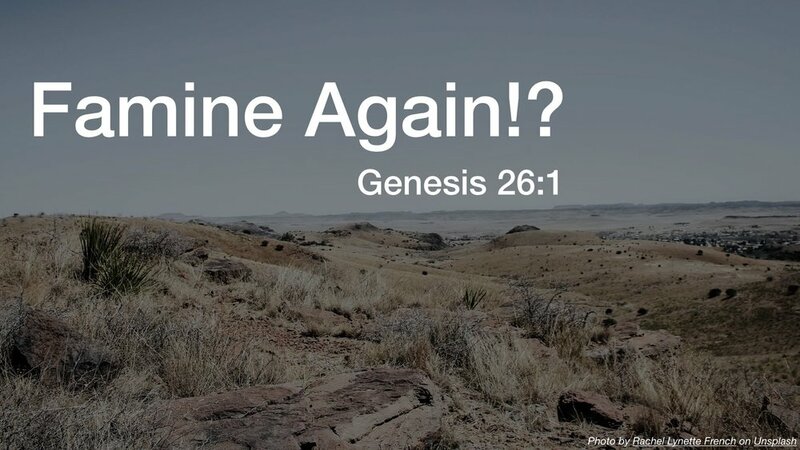 Next time Isaac moves God appears to him and renews the promise. Isaac responds by building an altar and calling on the name of the LORD. Isaac decides to pitch his tents there and his servants also dug a well there. In a surprising turn of events, Abimelech comes to Isaac. Abimelech who had told Isaac to leave now comes to Isaac with a friend and the commander of his army. At first glance, it seems that Abimelech is looking for a fight. Isaac is not happy to see them, he is not cordial and does not offer them any food. Abimelech confesses that he has witnessed God’s power and blessings on the life of Isaac. Abimelech wants Isaac to promise he will not attack him. Abimelech had in all likelihood expected Isaac to struggle in the wilderness and for his power to dwindle. But even though others came and took away the wells he dug Isaac continued to dig wells and continued to prosper and finally Abimelech had to recognize that no one could win against Isaac’s God, against the God of Abraham. There was something supernatural taking place int he life of Isaac, and even his enemies witnessed the power of God at work in his life. So he made them a feast, and they ate and drank. Then they arose early in the morning and swore an oath with one another; and Isaac sent them away, and they departed from him in peace. 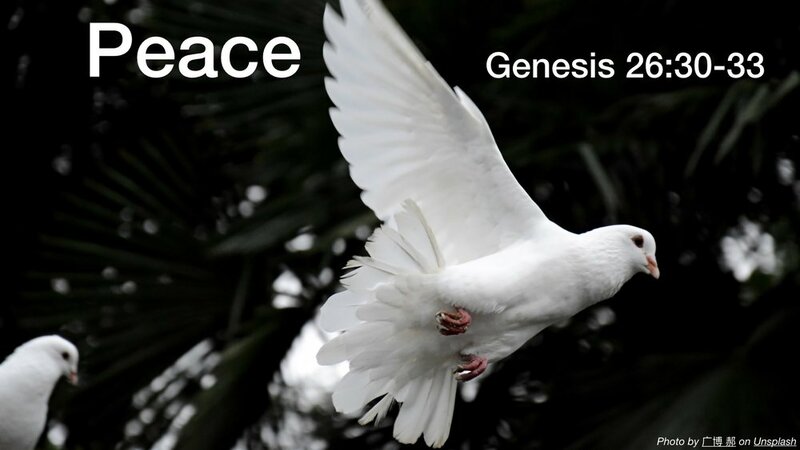 Isaac now had peace all around him and he continued to prosper. Isaac’s life was not easy by any means. He struggled, he worked hard, he was mistreated and found himself on what seemed to be the losing end of things. Isaac was scared, he lied, he fell short of what he should have been. But Isaac never rebelled against God. Isaac never gave up on God’s plan for his life, and eventually, God caused him to prosper, and all his enemies to recognize that he was blessed. Things will get tough, there will always be conflicts. We may even fall short in moments of fear and exhaustion. However, when we must refuse to give up on God since we know that He will never give up on us. Even though it may take a while, we know that God provides for all of our needs and it is God who causes us to prosper. God does not give up on us when we fall short. Isaac and Abraham fell short on multiple occasions. But they loved God, and God did great things through them. God can do great things through us, we should not count ourselves out just because in moments of weakness we fall short, but we should repent, confess our sins, and jump right back into the endurance race which is the Christian journey.